sweetened nuts and Tangerine Vinaigrette. In a 2-cup jar with a tight-fitting lid, combine sugar, dry mustard and salt. Add rice vinegar, tangerine juice and canola oil. Preheat oven to 325°F. On a parchment-lined, rimmed baking sheet, toss pecans with honey; arrange in a single layer and bake for 12–15 minutes. Transfer nuts to a piece of foil that has been lightly coated with cooking spray. Sprinkle nuts with sugar; set aside. In a large bowl, toss Boston lettuce leaves with radicchio. Shake vinaigrette and lightly coat lettuce leaves with dressing (you will have extra vinaigrette: refrigerate unused portion). Divide lettuce onto 8 salad plates. 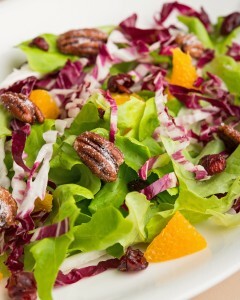 Top lettuce leaves with tangerine pieces, cranberries and honeyed pecans. Serve immediately.